On a few different occasions on the blog I mention that I am in a book club. For our last session I was the host which also meant that I got to select the book we would read & discuss. After much deliberation and researching, I settled on the Kitchen House as our group read. Towards the back of the book there was a recipe for Molasses Cake. A good portion of the book takes place in the Kitchen House along with several scenes depicting large celebratory feasts both inside the "Big House" and out in the field. 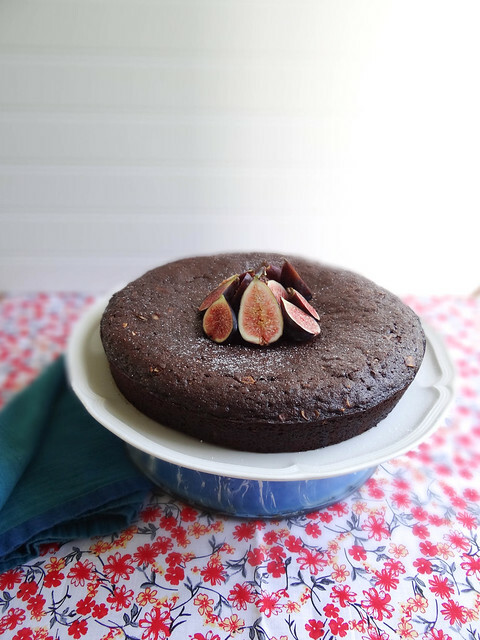 Throughout the book you will find Belle baking molasses cakes, after writing the book the Author and her daughter perfected what they would like think as Belle's version of molasses cake that she would bake in the book. 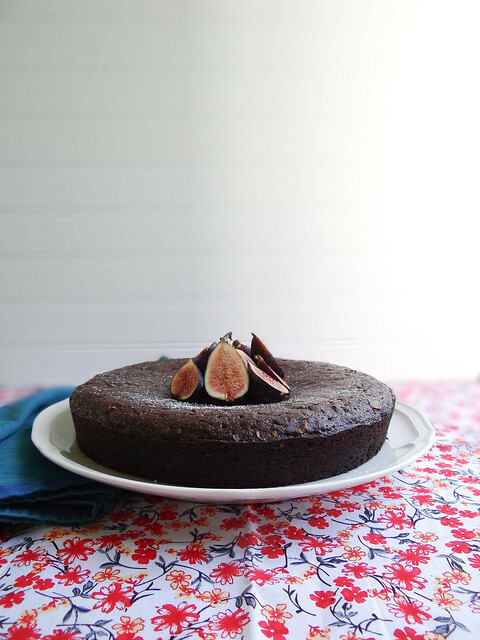 I would like to share with you my take on this simple & humble cake- not overly sweet but makes for a nice fall treat with a cup of coffee or tea. 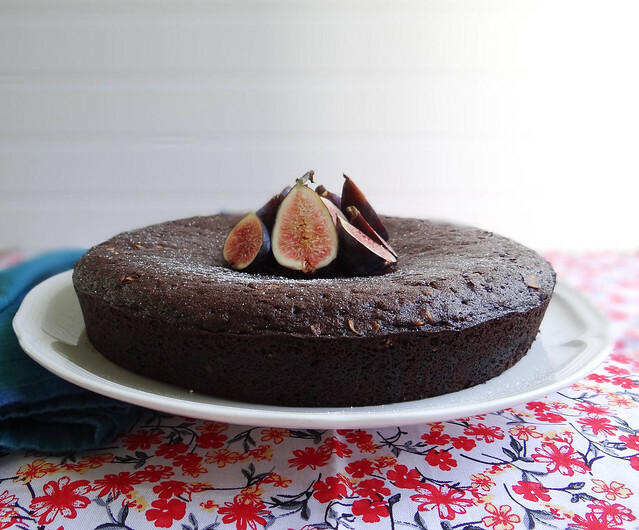 The Molasses cake was very rustic, fresh figs with a sprinkling of powdered sugar was the perfect way to soften the rugged perception of the cake. 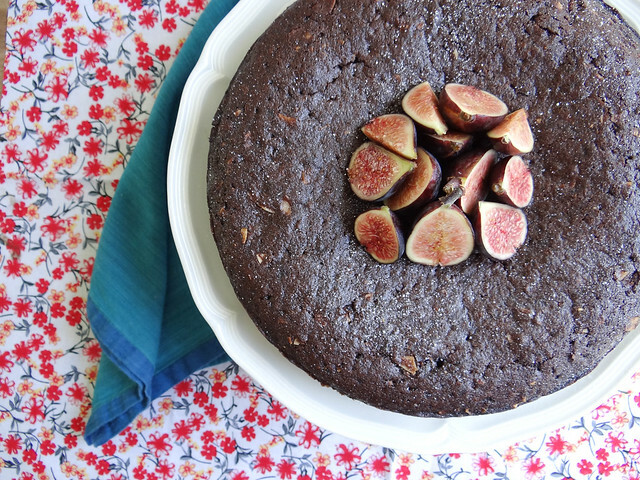 Have I ever told you about my obsession with fresh figs? 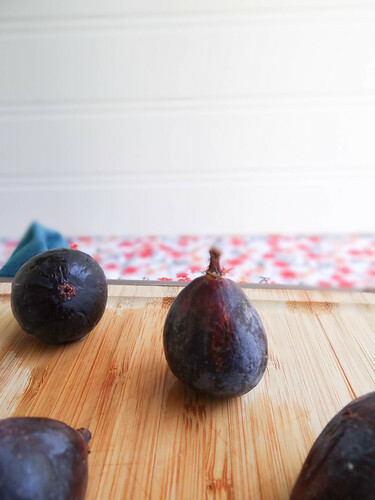 I would stare longingly at other bloggers with their beautiful posts and pictures featuring fresh figs - after some research I learned that fresh figs do not travel well and are highly perishable, therefore I had lost all hope that I would ever have the privilege of eating a fresh fig in NH. That was until I came across a package of Fresh California Figs at Trader Joe's! Some of you are lucky to live 5 minutes from 10 Trader Joe's- here in New Hampshire, we have 2 and they are both over an hour away from where I love. A trip to Trader Joe's is a truly a special occasion - one that takes place every couple of months. They were good figs, however I will admit, these fresh figs would never stand a chance against the figs Justin and I devoured enjoyed while in Mexico. Now those figs were amazing, those of you that live in a region where Figs are available by the bucket-full on every street corner are truly lucky. 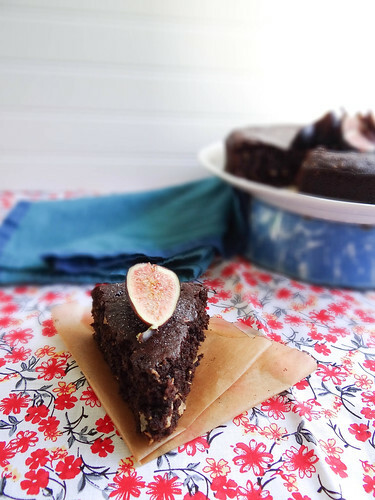 In addition to transforming the original recipe to vegan friendly I also added a good helping of coconut flakes and NH Maple Syrup - both were awesome additions and in my opinion make this cake even better than the original. If you are not a fan of coconut or find yourself out, simply omit and bake the cake a written minus the coconut flakes. Since this cake is not overly sweet, I recommend topping a slice with coconut whipped cream or your favorite vegan ice cream. Justin enjoyed his straight up with a big glass of cold almond milk. 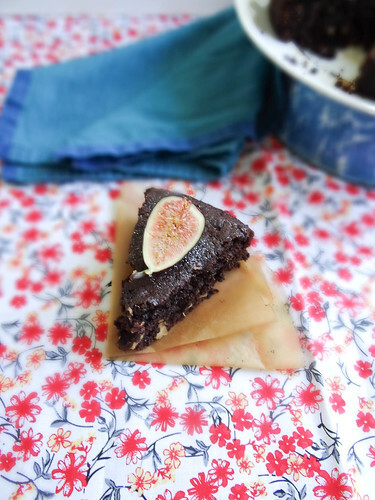 You could absolutely pass this off as a breakfast cake too- with very little natural sugars is better for you than most. What is your favorite "hard to get" ingredient? Do you live a place where you have specialty stores at the ready or do you live in an area where they are far and few between? Grease 8-inch round baking pan with coconut oil and line bottom with a round piece parchment paper. In a separate bowl, combine the maple syrup, flax egg, almond milk and the molasses. In another bowl, combine the flour, coconut flakes, baking soda, ginger, cinnamon and salt. Add each of these alternately to the butter mixture, beating well between additions. Spoon batter into the prepared pan. Bake for approx. 40-45 minutes or until a toothpick comes out clean. 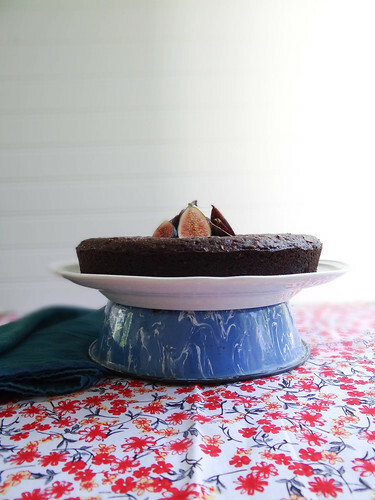 Remove cake from pan and place on a serving dish or cake stand. 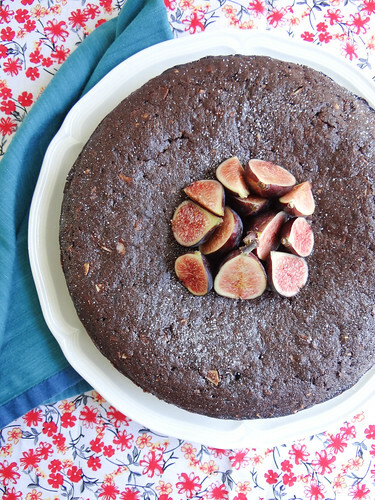 Garnish with fresh figs and a sprinkling of powdered sugar. Enjoy with freshly whipped coconut cream or non dairy ice cream! I would so love to live next to a fig orchard. or a Comice pear orchard. Both are fabulous Fall treats when they are fresh off the tree! Thank you for the recipe...cheers! Ohhh fresh pears, that reminds me I need to get a pear tree! what a beautiful cake! 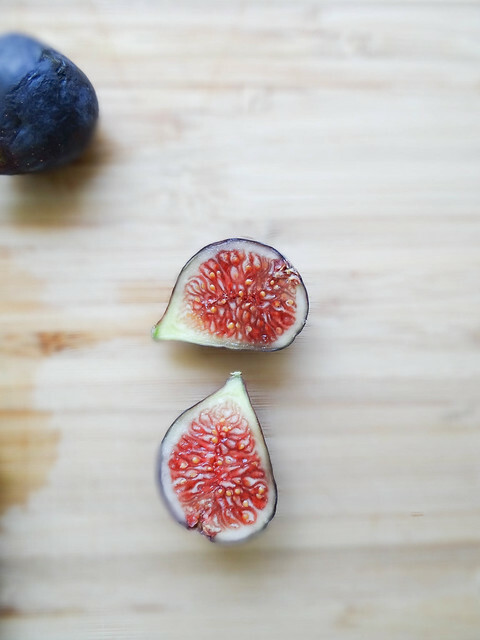 i love fresh figs, too, but don't get them very often because of their high price. i'm pretty positive that i'm going to plant a fig tree next year. Super jealous, the weather just can't support a traditional fig tree- there is a man that loves down the street from my Dad who is experimenting with growing figs- I hope he succeeds so he can share his secrets with me! 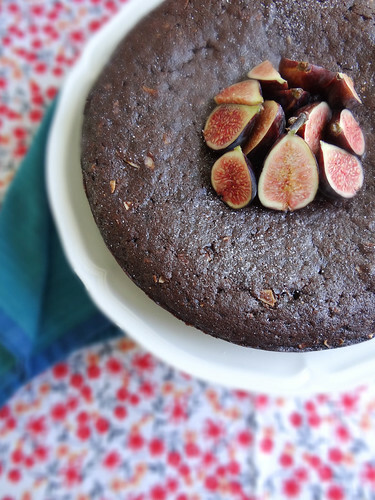 There is something about Molasses that reminds me of fall! Yum! I love molasses. I wish more things were sweetened with it! Thank you Ella- the figs are too pretty aren't they! 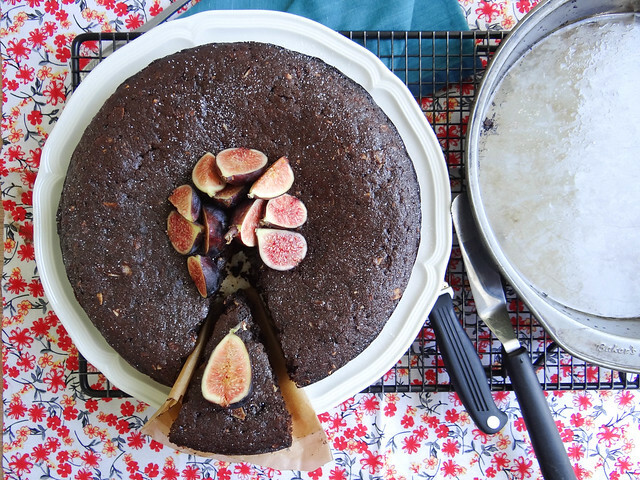 I love the look of this cake with the slightly sunken middle filled with fresh figs! I tend to prefer more rustic cakes too rather than the multi-layered and frosted kind...plus I can eat them for breakfast! Glad you were able to try some fresh figs...I agree that some are not as good as others, but when you get a good one, they're amazing! 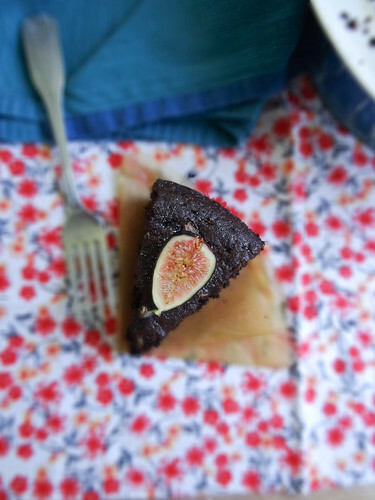 Seriously who doesn't love cake fore breakfast- this one is practically guilt free! Beautiful! I also love figs! I've found them at the Concord Co-op lately. I wish I was a baker because I'd be all over this! There's just something about all the measuring and mixing that is just too precise for me. Also, I heard a rumor there might be a TJ's coming to Concord. Not sure if it's true, but we can hope, right? 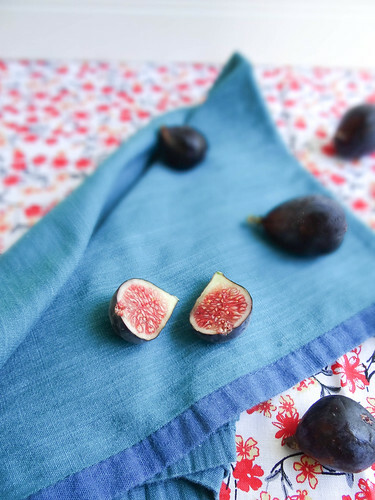 You are super spoiled, a fig tree in your garden- so jealous!